Classic Santa Fe I. 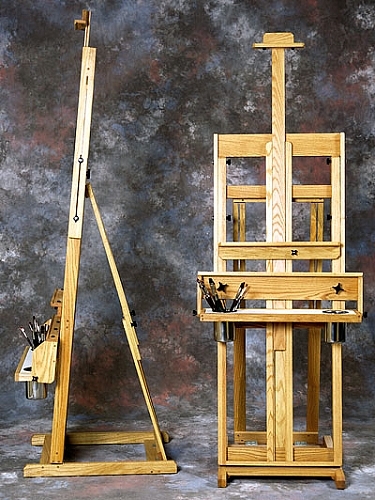 This single masted easel comes with two canvas holders and a painting tray. 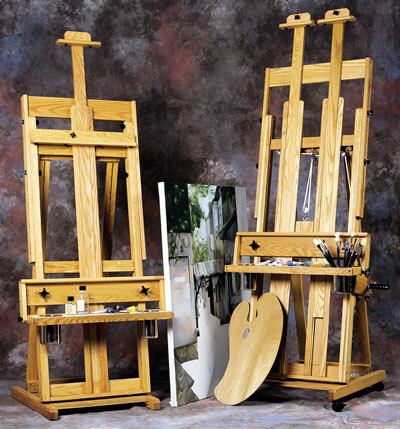 The middle canvas holder can be used for smaller works and the self leveling bottom tray/palette measures 30" wide by 7 1/2" and features a melamine paint mixing surface with 2 large stainless steel canisters.• Can hold canvases up to 96" high.• Base width/depth: 24" x 30".• Ceiling height: lowest setting is 78".• Highest setting is 120".• Front locking casters are optional.• Ships partially assembled by truck,additional freight charges may apply. 704 points will be rewarded when you are logged in to your account and buy this item.